During the height of the Depression-era looting of the Spiro Ceremonial Center in eastern Oklahoma, University of Arkansas Museum curator Sam Dellinger undertook special efforts to acquire some of the extraordinary artifacts plundered from the Craig Mound. With financial support donated by Colonel T. H. Barton of El Dorado, Arkansas, Dellinger purchased a variety of objects crafted from stone, shell, copper, wood, and woven plant materials. 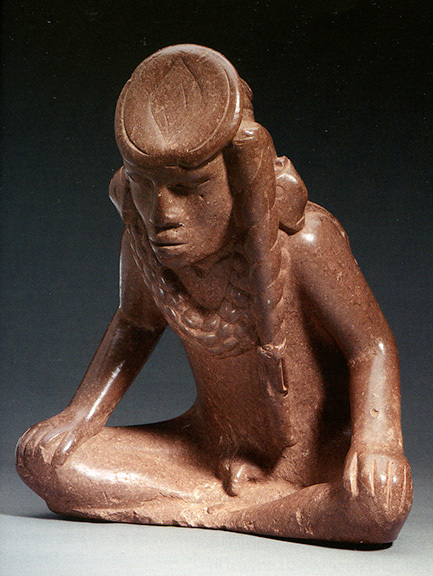 One of the most significant of Dellinger’s acquisitions is the so-called “Resting Warrior” figurine, a flint clay statue produced at Cahokia around 1100–1200 A.D. It was later transported to Spiro and at some point holes were drilled through the feathered cloak and into the back to convert the figurine into a smoking pipe. The figurine, measuring 26 cm in height, 23.9 cm in breadth, and weighing 5.2 kg, exhibits several features that lend credence to identity inferences. 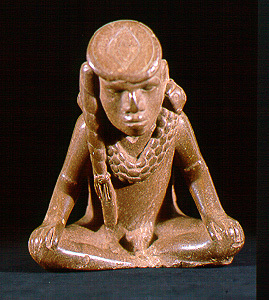 The male figure is presented in a cross-legged sitting pose, leaning slightly forward with both hands resting on the knees. Encircling the neck and extending across the chest is a multi-strand necklace of carved beads, and draped across the back is a feathered robe. Descending from the left side of the figure’s head is a long braid, and hair on the back of the head is drawn into a small bun. Dangling from both ears are “non-nosed god masks,” an attenuated version of the “long-nosed god masks” more often rendered in native copper. Surmounting the forehead is what appears to be a copper plate, embossed with an “ogee” motif and wrapped in a small cap secured by a strap extending across the back of the head, below the hair bun. A number of associations can be identified based on these features, suggesting links to culture heroes valorized in other Mississippi period artworks and in historically documented narratives collected from several Native American groups living across the Southeast and Southern Plains. A first association is with the “falcon warrior” theme widely expressed in Mississippi period artworks as well as in descriptions of historic investiture rites (such as the Osage wa-xo’-be ceremony) that confer elite male statuses symbolizing success in aggressive warfare exploits. There is a related association (via the hair braid and earrings) to the fabled warrior hero Red Horn or Morning Star, as recounted in Ho-Chunk (Winnebago) stories recorded during the early 20th century by ethnologist Paul Radin. These associations permit us to identify the Resting Warrior figure as a Mississippi period representation of the “warrior hero” character depicted in numerous historic Native American traditions. This is a useful interpretation, given what we understand of the context of the Resting Warrior figure at Spiro. It is one element of a collection of sacred objects that had been carefully arranged on the floor of the so-called “hollow chamber” within the primary lobe of the Craig Mound. Modern scholarship suggests that this arrangement comprised a diorama representing key personages and materials gathered for a world renewal ceremony. A carved Earth Mother figure was placed at the center of the diorama, with the Resting Warrior figure positioned along the northern perimeter and facing outward. This arrangement suggests that the Resting Warrior figurine functioned as protector of the assemblage and interlocutor with the human community. Imagery engraved on marine shell cups also incorporated into the diorama lends support to this renewal ceremony reconstruction. 3D CONTROLS - Use your mouse to rotate the object. Use your scroll-wheel to zoom in or out. Model created using the Artec Space Spider 3D scanner. This model and all other images on this page are copyrighted ©Arkansas Archeological Survey. Do not reproduce without permission.